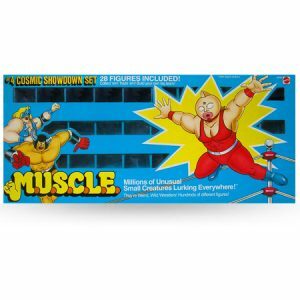 Here are 100 of our latest M.U.S.C.L.E. figures and accessories! Condition: Good, some wear and tear. Not the genuine poster from the 80's, but a superb scale reproduction faithfully re-created by MuscleFigures.com to the exact look of the original. This poster is not like other reproductions on the market – it features much clearer figures and graphics that match the original Mattel© poster exactly. 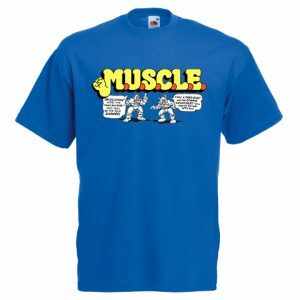 Looks absolutely fantastic as a piece of 1980's M.U.S.C.L.E. memorabilia! Track the whole of your flesh figure collection by ticking them off in the corner star! Size : 23 x 35 inches. (as original). Premium 190gsm Photo Satin Art Paper. Supplied rolled in long shipping box. Poster in the main image is framed (frame not supplied). Please allow an extra 5 days for shipping. Available in 10 different colors! Mens Heavyweight T-Shirt by Fruit of the Loom. 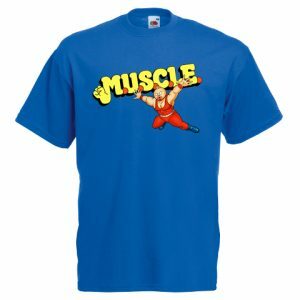 Printed M.U.S.C.L.E. Logo | 200gsm 100% cotton. Taped neck and twin needle stitching. All sizes are the same cost. All sizes and colors are the same cost. All sizes and colours are the same cost. © Copyright 2012-2018 MuscleFigures.com. All Rights Reserved.